1751 Hotel Plaza Boulevard, Orlando, FL, U.S.A. 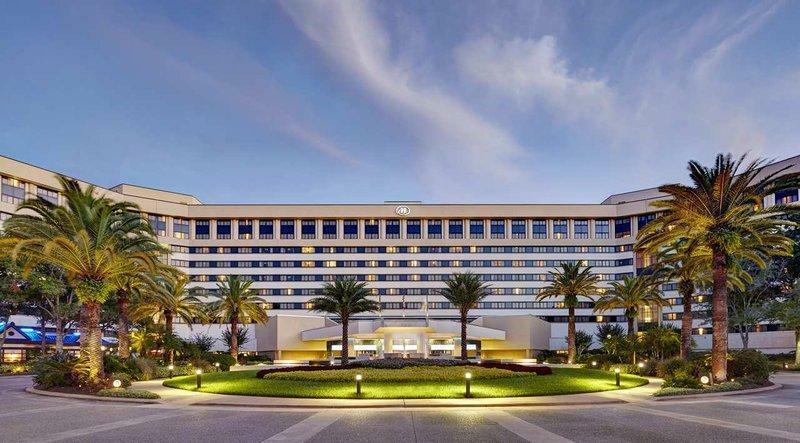 Located in the Walt Disney World Resort and a 2-minute drive from Highway 535, the Hilton in Walt Disney World Resort is geared towards vacation travellers who prefer a hotel with on-site dining, free Disney Parks transportation and easy highway access. This non-smoking hotel has 814 air-conditioned guest rooms, each offering free Wi-Fi, cable TV, a mini-fridge, an in-room safe, a coffeemaker, a desk, a hair dryer and an iron and ironing board. Standard rooms offer one king or two double beds, while rooms with a seating area and sofa and a dining table are also available. The hotel is wheelchair-accessible. Pets are not permitted. Hotel amenities include two outdoor heated pools, a hot tub, a fitness centre, meeting/banquet facilities, jogging trails, a business centre, shopping, a games room, guest laundry and a gift shop. A complimentary scheduled shuttle to and from all Walt Disney World Parks is offered, and begins one hour prior to the park opening, and ends two hours after the park closes. On-site dining is offered at six different restaurants, and a Disney Character Breakfast is offered each Sunday from 8:30 am to 11 am. Poolside dining is also available. A mandatory resort fee of $22 per night per room is applicable, and self-parking is an additional $13 per night. Valet parking is available for $20 per night. Guests will be given extended-hours access to Disney Parks. The majority of the reviews sourced for this analysis were positive, with much praise going to the hotel's staff, location and rooms. The hotel's staff were the source of numerous compliments by reviewers, who characterized them as efficient, helpful and personable. Many lodgers were pleased with the hotel's location. They found it to be within walking distance of Downtown Disney, as well as close to Epcot, shopping, restaurants, nightlife and highway access. Several patrons enjoyed their accommodations at the hotel. They described their rooms as clean, well equipped and spacious, with fast Wi-Fi and comfortable beds. It should be noted, however, that a few guests had complaints about their rooms (see below). While the majority of reviews consulted for this analysis were positive, there were a few common complaints about the added fees and the rooms. Several guests were disappointed with the extra costs they incurred while staying at the hotel. They complained about the hotel's resort fee, the added parking charge and the lack of a free breakfast. Some also felt the restaurants' food in general was overpriced and expensive. While the majority of reviewers enjoyed their clean and well-equipped rooms, a few lodgers reported dated decor and furniture, as well as some cleaning issues. Expedia.ca guest reviews rated the hotel 4.3 out of 5 with a 91% recommendation rate from 2,066 reviews. TripAdvisor.com guest reviews ranked the hotel #124 of 329 Orlando hotels with an average rating of 4 out of 5 from 1,429 reviews. Booking.com guest reviews rated the hotel 8.6 out of 10 from 271 reviews. The author called the hotel on July 1, 2013 to verify some information. Rating: #5 out of 553 hotels in Orlando ranked by guests. Awesome location, accommodations and service. "Was not impressed in this day and age that internet access is not wireless and free." "Beds were very comfortable and it was quiet the halls smelled of smoke sometimes - wondering if some quests were maybe sneaking a smoke - how is that situation controlled? did not use amenities but they seemed very nice location and bus schedule were very good"
"evrything was excelent at the hotel once we were able to get into our room. we had to wait till almost 5pm to get in, we arrived at 4:10. they did put out a complimentary spread everyday we were there, and at least they enabled us to enjoy it, even though we were not in our room." "Terrible service. I travel a lot and recently stayed in another Hilton that was wonderful. Staff members were poorly trained and disrepectful." "My daugther called me for an emergency and I was out. The lady in the front desk was rude to her. Her name was Rudi. Besides that everything else was perfect!!!" "We were able to get in at the last minute... The hotel looked nice and fresh...very clean. I liked that it did not have the typical Disney atmosphere, as we were traveling without children. Our room was quiet and comfortable. I will be staying here my next visit to the Disney area. I suppose my only "complaint" would be that our room was located a bit too far from the elevator." "When a request was made for a refrigerator to be put in my room, the desk attendant instantly called and requested that it be put in the room. Also it was very convenient that I was able to purchase my tickets for the theme parks right in the hotel at the disney store. On the down side, it cost me $5.00 for an old cardboard box I needed to flatten so I could pack a couple pictures in my luggage. Over all I was very satisfied with the hotel though." "Everyone was very helpful since my husband needed help with his new knee." "We were very pleased with this hotel and I would reccomend it highly." "Next time wil stay at the real disney hotel. Would not give us a ikiung room as reserved. Gave us 2 double beds." "My husband said it was the first hotelbed that didnt give him a sore back. I agree." "yes......I was told at check-out that they would e mail my statement of expenses......2 weeks and I haven't received it yet. this is my only complaint."